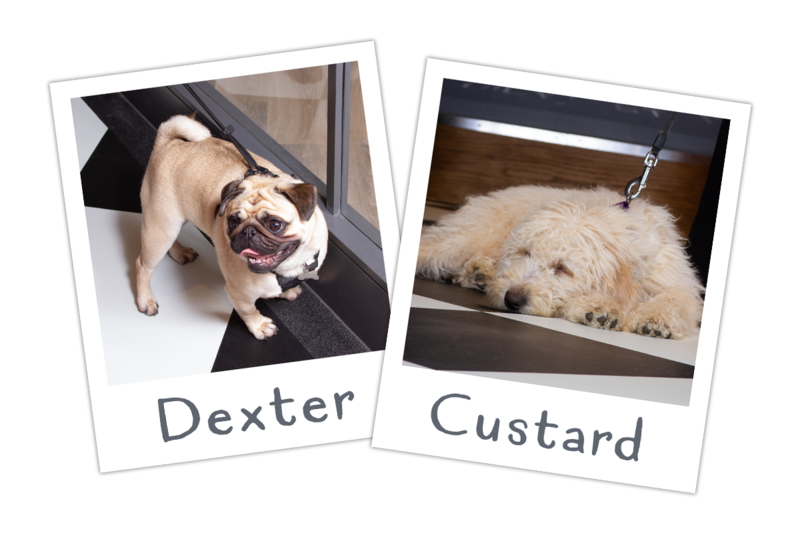 Meet Charlie and Dexter the Pug & Ali and Custard the Labradoodle! They were lucky enough to be the first to try out the new Dogwood Spa at the Brighton Racecourse Pets Corner. Let us take you behind the scenes to find out exactly what happens at Dogwood! Dexter is a 2 year old pug, he has a short and smooth coat but sheds a lot! Before getting Dexter I never thought that I would need to take him to the groomers but it can be just as beneficial for short haired dogs. I brush Dexter not nearly as often as I should but we both have very little patience at home! When we arrived at Dogwood we were greeted by the lovely Julie, Director of Dogwood, she asked about Dexter’s coat, if he had any allergies and what treatments Dexter wanted. We decided on the ‘Shortie Package’ which includes two washes with the Dogwood natural shampoos, a blow dry and groom to get rid of all the dead fur, cleaning of the ears and clipping any long nails. Because of Dexter’s breed I also chose the ‘Blueberry Facial’ to give his facial folds a good clean which I struggle to do at home. I filled out some paperwork and off he went! Firstly for his bath, after a good rinse they used Dogwood Nature’s Glow Shampoo which removes the dirt, grease and odours without stripping the coat of natural oils. She gave him a good scrub and he loved the Blueberry facial as you can see, this is something that he would not let me do at home so I was really pleased with this treatment. Julie then gave him a good rinse and a quick blow dry using a high powered but gentle dryer. Dexter was then moved to the grooming station where he had a good brush along side a gentle blow dry to get rid of his dead fur. Julie also cut Dexter’s dewclaw which I am never brave enough to do, and a good clean of the ears! With a final spritz of Dogwood Nature’s Glow Body Mist to keep him smelling fresher for longer he was ready to go! I loved our Dogwood experience, especially seeing how much Dexter was enjoying it! It can be worrying leaving your dog with strangers but Julie and the team took such great care of him. Custard is a giant, mischievous, labradoodle puppy who loves going for long field walks and splashing in puddles. This does mean she gets very grubby so we have accepted that she will need to be treated to regular puppy pampering to keep her floof level at maximum cuteness (and minimum grossness). We already have two cats and have been using a mobile groomer up until this point. While she has been great, we wanted to find somewhere local we could take all our pets, that provided natural treatments and we could rely on 7 days a week (we do work you know!). Dogwood ticked all the boxes so we had to give it a try! 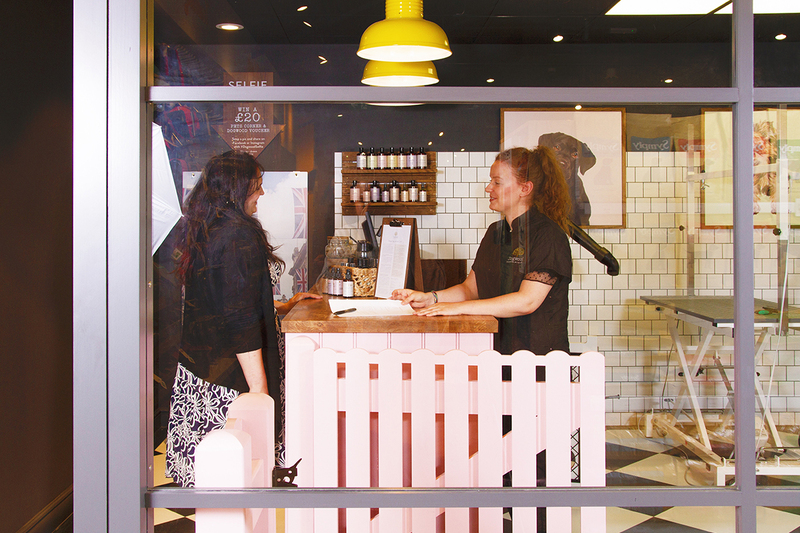 Walking into our local Pets Corner, your eyes are instantly drawn to the super stylish pet parlour. True to Pets Corner ethos they give “human standard” care to everything, so the salon both looked great and was fully kitted out. We were greeted by the lovely Julie and Kelly, who made a lot of fuss of Custard and explained the need-to-know stuff about Dogwood. 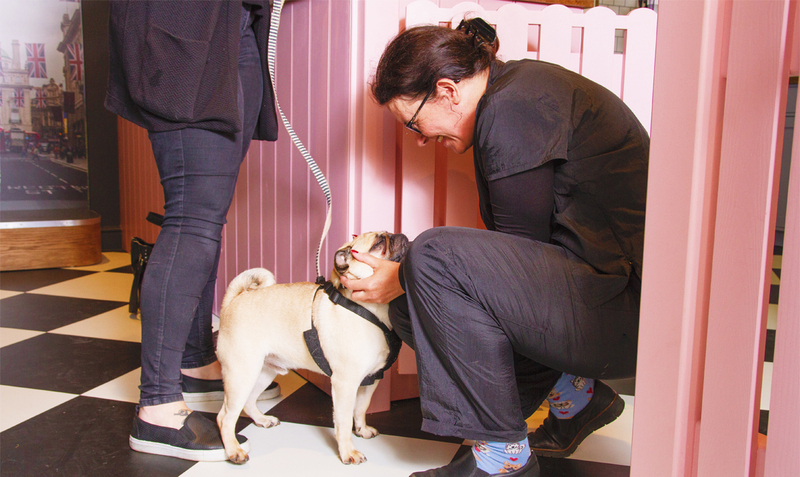 We chatted about what Custard’s needs were and the kind of look to go for, settling on the ‘Puppy Pamper Package’. She was then whisked off to the back room for a thorough wash and doggy face massage (yes, seriously). 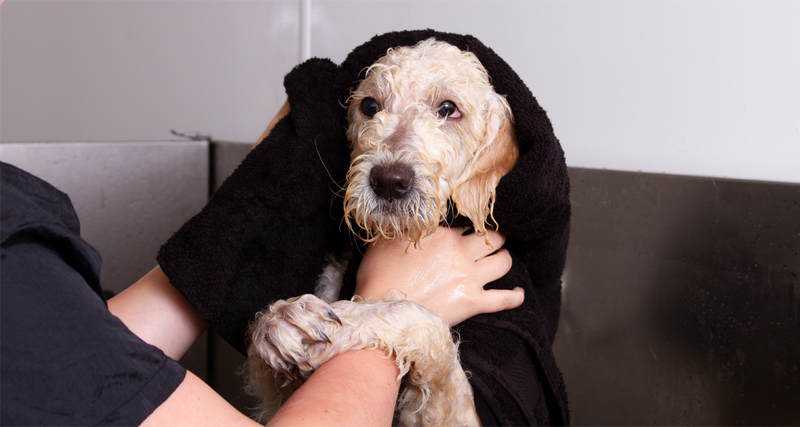 They used the ‘Dogwood Puppy Shampoo with Lavender’ which smelt divine! Custard has never been to a groomer before so I was a bit apprehensive of how she’d cope! I will admit, at first, Custard was not a happy puppy, but Kelly reassured her the whole time, taking time to settle and relax her. While I was also a concerned mummy, I was also an ashamed mummy; Custard was in need of a good pedicure, but Julie chatted to me and made me feel much better, giving tips on how to keep up the maintenance at home. After the wash, came the drying. Once again, Custard was not pleased by this to begin with and was crying. I’d stuck around to watch the process but Julie suggested that she might settle more without my presence. So I snuck off out of sight and like magic, the Custard started to chill. Unfortunately, this does mean I can’t narrate the rest of the drying, but I know it involved towels and a very big hair drying machine. Once Custard was completely dry and refloofed, Julie attended to the “beauty treatments”: hair and nail clipping. I’d mentioned that my other half was insistent that she retain her curly coat, but that we wanted a nice trim and tidy. We got exactly that and she was the sparkliest, softest Custard afterwards we could have hoped for. To finish she had a spray of the Dogwood Puppy Body Mist with Lavender to keep her smelling fabulous! During this time, the team were still chatting with other customers and it was really nice to see how they balanced all of these different interactions. They could easily have ignored one of us, but we were all treated like individuals and given time and attention. Overall, all I can do is give a glowing review. Super pleased with the service and the team. I would highly recommend. 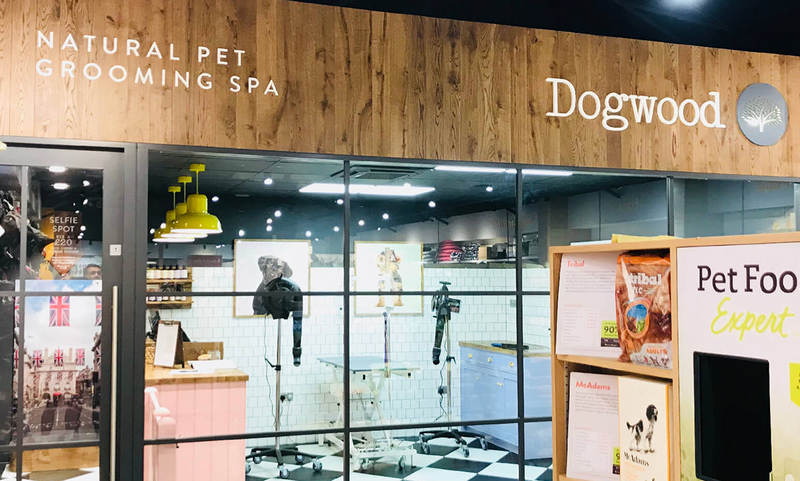 Dogwood is the Natural Pet Grooming Spa from Pets Corner, your pet will be lovingly pampered by our staff in a clean and safe environment, finished to an exceptionally high standard at a fair price. We understand that every pet is an individual and we tailor our services to their needs. Being a natural pet grooming spa, we use our own range of natural shampoo conditioners and sprays containing the finest organic extracts and oils, deep cleansing but kind to the most sensitive skin. To find your nearest Dogwood Spa click here. No Dogwood near by? Treat your pups to an at home spa with Dogwood Shampoos and Body Mists sold at Pets Corner online and in store! To find your nearest Pets Corner store click here.